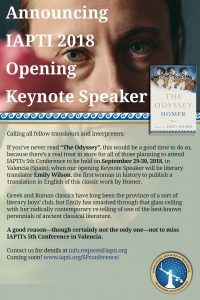 Calling all fellow translators and interpreters: If you’ve never read “The Odyssey”, this would be a good time to do so, because there’s a real treat in store for all of those planning to attend IAPTI’s 5th Conference to be held on September 29-30, 2018, in Valencia (Spain), when our opening Keynote Speaker will be literary translator Emily Wilson, the first woman in history to translate this classic work by Homer. Greek and Roman classics have long been the province of a sort of literary boys’ club, but Emily has smashed through that glass ceiling with her radically contemporary re-telling of one of the best-known perennials of ancient classical literature. Despite having only been translated into English a total of about 60 times since it was written in the 8th century BC, all of those translations of “The Odyssey” have been carried out since the 16th century. But Ms. Wilson’s is clearly ranked among the most original, and not merely because it is the work of a woman. An epic poem consisting of more than 12,000 lines, “The Odyssey” has become the focus of ever more avid interest among classicist translators in recent years. It might appear to the uninitiated that there would be little more to debate about such an ancient text by this time in history. But for scholars with the vast experience and learning of Emily Wilson, nothing could be further from the truth. Her fresh interpretation of this has caused a stir in the intellectual community because of its originality and deep understanding of the story’s nuances and meanings, far above and beyond the task of translating the words as such from one language to another. This keynote speaker alone, then, is a good reason—though certainly not the only one—not to miss IAPTI’s 5th Conference in Valencia.